RTI, a control and automation manufacturer for residential and commercial settings, announced its product lineup for CEDIA Expo 2018, taking place Sept. 6-8 at the San Diego Convention Center. In Booth 2627, the company will be showcasing its new RTiQ intelligent remote monitoring solution, AV distribution solutions including the Miravue VIP-1 video-over-IP system, and the latest version of RTI's Integration Designer APEX programming software. In addition, the company will introduce its new RTiXcel learning management system (LMS) for dealer training and exhibit its complete lineup of advanced processors and controllers. "Last year we celebrated our 25th anniversary by delivering products, software, and services that our dealer and distributor partners were telling us they needed," said RTI CEO Ed McConaghay. "The response has been amazing, but we're just getting started. Our Integration Designer APEX programming software continues to evolve as we add even more time-saving features. For instance, a recent addition is RTiQ, a monitoring solution that not only notifies our dealers of issues but also allows them to resolve them remotely. This year we also released powerful new processors and a complete line of AV distribution products, and we acquired Miravue, our new video-over-IP system. With all of these solutions on display, along with more exciting product and service announcements, CEDIA is going to be a great show." A complete remote management solution for RTI systems, the cloud-based RTiQ can be configured to monitor any component controlled by an RTI XP control processor. Dealers can monitor the status of these devices via a dashboard from anywhere in the world and receive email and text notifications that alert them if a failure occurs. Once alerted, the dashboard helps identify the cause of the issue and allows custom actions to be triggered to restore the failed system or component. RTiQ is free to RTI dealers and is available on both Integration Designer 9.x and APEX. RTI's line of AV distribution products includes HDMI, HDBaseT, and modular video matrix switches that deliver reliable, high-quality 4K video throughout an installation. In addition, a range of extenders, splitters, and wall plates are available to meet the unique needs of every installation. 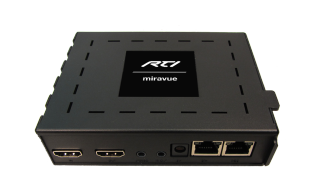 The Miravue VIP-1 video-over-IP transceiver acts as a transmitter and receiver in one versatile device. Reducing cabling and installation time, the system enables powerful, scalable AV distribution over wired and wireless ethernet networking with ultra-low latency. In addition, network video streams from IP cameras may be viewed without the need for additional equipment. Visitors to RTI's booth will also see the latest version of the company's Integration Designer APEX programming software, the biggest leap forward since its release last year. The new software allows integrators to take advantage of the RTiQ remote management and the VIP-1 video-over-IP system and includes a range of features to make programming even easier and more efficient. These include support for layers and shared layers to manage complex layouts, viewports for RTiPanel devices that can be swiped through, source bundles that allow integrators to export fully developed interfaces for reuse in any project, and more. While live training events for RTI have been getting record attendance this year, at CEDIA Expo 2018, RTI will introduce dealers to its new state-of-the-art online learning management system (LMS), named RTiXcel. Designed to provide an end-to-end curriculum, complete with testing and certificates, RTiXcel allows dealers to learn more effectively online and at their own pace. The system offers a host of content designed to engage dealers, including virtual walkthroughs, troubleshooting steps, interactive installation guides, and more. RTI's complete offering of handheld remote controls, touchpanels, and keypads will also be on exhibit. Control processors on display will include the XP-6s with a rack-mountable design and the XP-8v, featuring an HDMI output to enable a customizable on-screen display (OSD) control interface. On Friday, Sept. 7, RTI will host four training sessions in Room 2. "Explore the RTI Product and Software Ecosystem" will be held 9-10:30 a.m. and 1-2:30 p.m., while "Flexibility & Simplicity — Unlock the Power of Integration Designer Apex" will take place 11 a.m.-12:30 p.m. and 3-4:30 p.m. Attendees can sign up to attend these free manufacturer training courses by registering here.